This trail connects Zelengora and Maglic. The hike from Suha brings you near to the borders of Perućica indigenous forest nature reserve, passes below Maglić and descends to the heart-shaped Trnovačko lake. 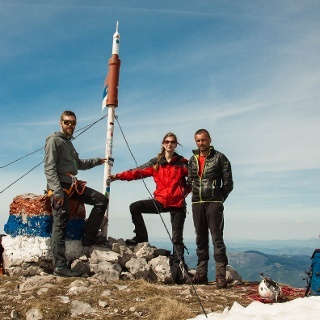 The hike starts from the parking area at Donje Bare (1490 m) and finishes at the main road of National Park Sutjeska, just 3, 5 km away from Tjentiste (600 m). Parking is situated near the lake, and there is a mountain hut that is possible to rent, but we advise making a reservation at the info center of National Park Sutjeska, due to availability issues during the main visiting season. Behind the hut, at the most western part of the lake, is a source of fresh water. From the lake, the path heads east and orientation should not be difficult, as your goal is to descend into the canyon of Sutjeska River. Before turning left and starting your descent, it would be nice to visit the Borić viewpoint. Overlooking the Canyon of Sutjeska River from Borić, it’s possible to see the highest peak of B&H - Maglić, as well as Volujak Mountain. Once you are back at the junction, there is a sign pointing towards Kovačev Panj. Follow the gully across the meadow and soon, red and white circles will appear on the trees, as you will enter a forest of tall beech trees. Although the path is not frequently used, the markings are still good and visible, and path is very obvious and easy to follow. After two hours, you should reach the main road of Tjentiste. This road goes north to Tjentiste, which is where the administration center of the National Park Sutjeska can be found. Historical monuments, a hotel, a restaurant and additional facilities can also be found there. However, the VD trail follows the road to Dubrovnik, heading south for another couple of kilometers. The hike continues from the parking at Suha (650 m), follows the forest road for a while and splits towards the ridge above on the left. 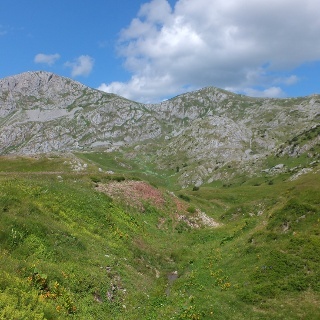 The ridge leads you towards Prijevor – a pass beneath Mount Maglic, the highest summit of Bosnia and Herzegovina (2386 m). It joins the road again, which disappeares first as a track, then as a trail again. It descends to the valley of Suva (Dry) Jezerina. 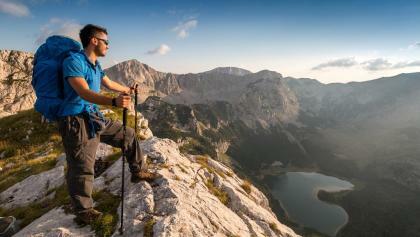 From Suva Jezerina, the trail climbs up to Trnovacko Lake which is your final destination. The border line with Montenegro is actually across the Suva Jezerina. Reserve a night at the hut in Prijevor, and travel to Trnovacko lake and do the Maglic ascent the next day. 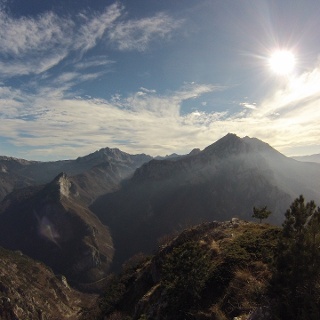 The ascent from Prijevor is challenging, but a great accomplishment. Consider that this tour goes trough remote wilderness. Mind your step on difficult terrain and watch for snakes when reaching with your hands or sitting on the grass in the shade. There are couple of spots suspected of landmines at the end of meadows on Donje Bare, and by the road to Suha. Those areas are clearly marked with warning signs, so respect the signs! Standard hiking equipment. If you are not staying at Prijevor mountain huts, then camping equipment is needed as well. Go over the meadows to the trail crossing with the option of going to Boric view point, and turn left here, till coming to a road that somewhat remains on the marked trail. When you reach the asphalt road with a sign to Dubrovnik, go right and follow the road for a couple of kilometers to the entrance to Suha and a parking area. From the parking area, follow the dirt road that goes up the valley. Very soon the road will make a sharp turn left; there, you should continue straight following the white and red trail markers, taking the shortcut through the forest. In the forest there is a national park watchtower near which you should pass, before getting on the road again. From that moment, only twenty meters away, you will encounter a sign on your left, showing you a junction and hiking path towards a ridge up above. This point is only about 20 minutes from the starting point. After you take this left turn, the path is marked by white-and-red circles and goes steep uphill all the way to the ridge. Approximately one hour later, you should reach a ridge and a new junction. The left path leads down into Perućica primeval forest and should be ignored, while you should take the right one, which follows the ridge (south-east direction). From this point, there’s no more white and red signs on the trees, but the orientation shouldn’t be difficult as the path is very visible and all the time goes along the ridge until you reach the Prijevor pass. At one point, the path comes to a flat part of the ridge and it’s harder to see, but looking to the right, should direct you towards the last parts of the ridge where the path is more overgrown by young trees and shrubs. 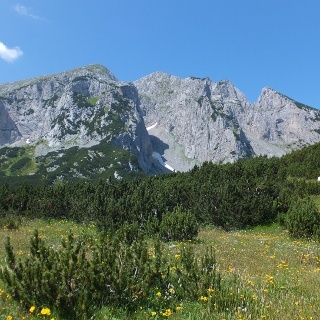 After approximately 1 hour and 40 minutes you should reach a meadow with the peak of Maglić (2386 m) dominating the landscape in the background; passing near the watchtower, you will reach the road and parking spot at Prijevor pass. Just beneath the parking area in the westernmost point, you can refill your water as there is a source of fresh water that exists all year long. From here, your trail goes south, following the dirt road where some shepherd’s huts can be seen above and later on, below the road. At a few spots, the road is taken away by rockslides and some 30 minutes away from Prijevor, the road divides into two paths. In the end, both paths will get you down to the Suva Jezerina, but the one on the right, which pitches downhill, will take you to the crossing that has a sign pointing left towards Trnovacko lake. You’ll reach the lake in less then 30 minutes from here. No public transport to Donje Bare, but there are bus lines to Dubrovnik passing through Tjentiste. From Tjnetiste follow signs to Donje Bare (to the right at the entrance to Tjentiste). At the end of the macadam road. 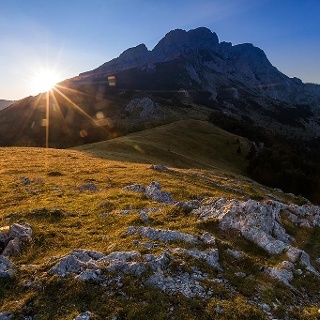 Bosnia & Herzegovina (Bradt Travel Guide) by Tim Clancy - Sutjeska National Park has a special attention. If you are joining the trail from Sarajevo, there are direct buses to Tjentiste (you do NOT have to change at Foca). The bus stops you at Hotel Mladost which is north of the trail. If you do not need to stop there, ask the driver to drop you at Suha camp instead to camp or start your hike to Prijevor (it's not an official bus stop, but drivers seem to pick up and drop off from anywhere on the road). Prijevor is a beautiful place to camp and watch the sunset. There is constant running water available. No toilet (unless you stay in the huts I assume). The hike to Trnovacko Lake is quite straight forward (2 hours). There is a park ranger there who records your passport details and charges €1pp entry and €1.5pp to camp (can pay in marks or €). He isn't the most pleasant person. This lake is stunning to camp next to and go for a cold swim. There are no mosquitoes and minimal insects. There is a constant water fountain, 2 drop toilets and two huts. If you camp there, you can order grilled lamb and vegetables from the ranger a day in advance (saw others do that, not sure how much it cost). There is no requirement to get an entry stamp in the passport in advance to cross from BiH into Montenegro (which is stated on the 12 Things to Consider... page). You can enter here without issue and exit Montenegro (mine was the road crossing between Kotor and Dubrovnik) and they do not care. The Montenegrin embassy in London also confirmed that as long as I had my passport at the crossing, this would be no problem. If you are from a country that requires a visa to enter Montenegro, this may be different however. Hi all. I'm trying to find info for the border crossing from BH to Montenegro. Do you need to apply for a border crossing permit beforehand?